The Sofia Bishopric has labeled the Friday refusal of the Diocesan Council of prelates and vicars to sign the list of representatives from the Sofia Diocese to elect a new patriarch a "sabotage." The list was prepared by interim Patriarch and Sofia Metropolitan Kiril. The Bishopric admits that there have been disagreements in the process of preparing the list, but their escalation, they say, was a clear sign that the story aims at sabotaging the election. The statement, issued Saturday, further stresses that such act is unacceptable in the light of clerical discipline and canonical spirit. It pledges that the very same list would be presented Sunday before the Diocese voters, who are to elect Diocese representatives to elect the country's next patriarch. On Friday, Sofia's Diocesan Council of prelates and vicars did not sign the list on grounds they did not know the people in it and that it did not include representatives of 6 districts near Sofia. One vicar, Father Petar from the town of Samokov, admitted he was threatened by Bishop Kiril with sacking and vowed to file a claim with the Holy Synod on Monday for violation of the Church Code. Others went even further in accusing Kiril of an attempt to sneak in the list his schoolmates, formers agents of the Communist State Security (Kiril was exposed as such along with 11 other metropolitans), drunks, and even pedophiles. The list included the names of 15 clergy and 8 laity. Among the latter one could find names such as Aksiniya Dzurova, daughter of the Communist Defense Minister, Dobri Dzurov, expert in Byzantine history and a known collaborator of military intelligence. Writer Anton Donchev, author of the novel "Time of Violence," is also on the list. The novel gained fame during the times of the Communist regime and was even made to a movie. It tells the story of a Bulgarian Christian region, selected by the Ottoman rulers in the 17th century, to serve as an example of conversion to Islam. A Janissary, who was taken from the village as a boy, is sent to force the reluctant inhabitants to convert to Islam. The local Turkish governor seeks a peaceful solution, but ultimately torture, violence, and rebellion break out. Donchev has been accused of using his undisputed talent to write the novel on the order of the Communist regime at times it was forcefully changing the names of Bulgarian Muslims to Christian ones in what is known as the "Revival Process." The author is also known to be close to former Bulgarian President and former leader of the Bulgarian Socialist Party, BSP, Georgi Parvanov. A rift among the Bishops shook the Holy Synod after Bulgaria's Patriarch Maxim, who led the Church since 1971, passed away on November 6, 2012, at the age of 98. The election of a new Patriarch will be held on February 24, 2013. 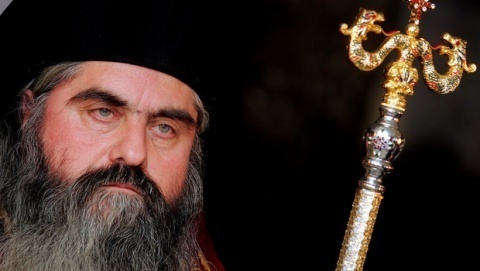 In the aftermath of the Patriarch's death and of the controversial election of Varna Metropolitan Kiril for Sofia Metropolitan and interim Patriarch, Plovdiv Metropolitan Nikolay declared he was withdrawing for 40 days for mourning and would not attend any Holy Synod meetings, but later changed his mind. Nikolay has not been exposed as a Communist Security Agent, but he is too young to have been recruited. He is also too young to be elected patriarch. Varna Metropolitan Bishop Kiril attracted much controversy in the end of 2011, when he appeared to service with a brand new Lincoln MKZ Hybrid, apparently commissioned even before being officially released in European markets. As recently as January 6, he appeared in front of laity in Varna gathered for the major St Jordan's Day in the Lincoln and proceeded to sprinkle the congregation with holy water, reaching from within his luxury vehicle.